It takes a fair bit of distance between listening and writing to say anything at all about this début solo LP from the veteran Mistah Bohze. Up close it’s a gloriously chaotic array of beats, samples and lyricism, which for intelligently designed eclecticism can properly be said to be comparable to the more free form end of Jazz. In fact you can run the full gamut of original and creatively adventurous genres in the search for a decent way to describe this album and at the end you’re unlikely to have said anything which really explains it. Which makes it a bit of a pain in the arse to write any coherent reviews of to be honest, but it’s one of those good problems to have given how good Blastoid McGonagle actually is. As with most things in the world these days, Hip Hop does have a tendency to go around declaring that every new release is an innovative epiphany as far as the genre goes, or at least whoever writes press releases for them does. For once though there’s an actual reason for the hype about an album because this really is something worth holding up beyond the routine. intricate without having to lay on a dozen layers of pointless poetic affectation to make a point. 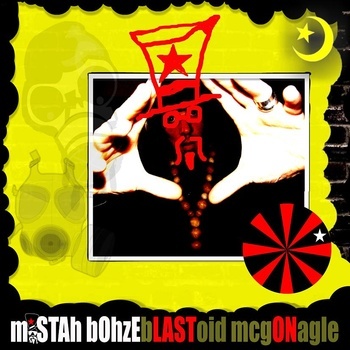 The delivery is, again, perfectly meshed into the album with Mistah Bohze showing a vocal certainty which matches the lyricism and a swinging, bombastic style which feeds into and off of the beats to the point where not finding your head nodding probably means there’s something a little bit wrong with you as a human being. Picking out strand out tracks is a bit of a mission here given the abundance of good stuff but for personal preference I’d point to ‘A Lot of Emcees’, ‘Soul U Gotz?’, ’Oppositional Thing’ and ‘Winter Shutdown Exibit A1′ although this is definitely an album to listen to, not one to cherry pick individual parts from. So, enthusiasm aside, any downside? Not really, it’s an excellent album. good review, agree with most of that. superb release. more of that please mistah bohze!